If you would like your horse started using natural horsemanship methods then please consider our training program here at La Pasion Paso Finos LLC. I believe your horse should be enjoyable at the show as well as on the trails. 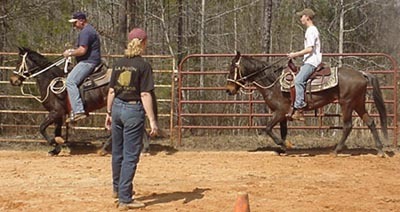 Our horses are trained on the trails as well as in the arena. The result is a horse that you can enjoy to ride no matter where you are. Our Paso Finos are started with traditional Paso Finos methods combined with Natural Horsemanship to get a well balanced horse. 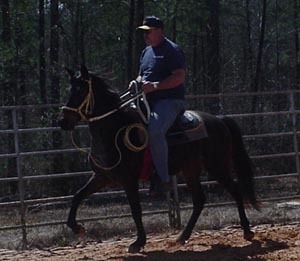 We will be glad to help you with your show horse and will start showing again in the spring of 2011. We have won several National Awards in the Show Ring. Our Paso Fino show horses are also our Parade horses, drill team horses, and horse that we enjoy on the trails. We also start all other breeds as well as retrain problem horses. I have experience starting all breeds from teaching the miniature horse to pull a cart to starting the Draft Horse under saddle. We are now beginning to get involved in mounted shooting and are currently training horses to be shot off of. Whether you have a show horse or a trail horse that you need help with, please consider our training program here at La Pasion. Please call for rates and availability. ...If you are new to the Paso Fino Breed and would like to learn how to ride the Paso Fino in a safe and relaxed atmosphere, we are available for riding lessons. The rates are $25 a lesson. We have many different horses that you can choose from. One of them will be just right for your learning experience. Please contact us for times available. If you would prefer to learn to ride quarter horses. We also have those available for riding lessons. We have several options for boarding and can customize boarding for your needs. We offer lots of love and at tention to the horses that call our farm home. We have a knowledgable staff that will give your horse all of the special attention he needs. The horses are monitored nightly and are kept a very close on during the day. We also have many special amenities at the farm that the boarders can take advantage of. Apolo Elegante - Double Resorte Pinto Paso Fino Stallion. His babies are very gentle and very easy to train. Espartaco de Casta - Capuchino and Juan Juan Buckskin Performance Stallion. His babies are currently winning in the showring. Chico - Black and White APHA stallion. I got Chico because I trained several of his babies for a client and they were such level headed and easy to train horses. If you want size, color, beauty, and a very level head in a quarter horse or paint horse foal then you should breed to Chico. Our first Summer camp will be the first full week after school is out. This is a great learning experience for your child and they always have alot of fun! They will take are of the whole farm for the week so they learn how a horse farm is run. They will feed, water, and vet the horses first thing in the morning. Then we usually ride until lunchtime. They can bring their own horse so we can work on their partnership or they can use one of mine. We usually cool off a little after lunch and do some crafts and then ride again in the afternoon. The cost is $300 and space is limited so reserve their space early!! The Christmas Break Winter Camp is more of a no frills camp where the kids bring their own lunches and snacks and do not receive the t-shirts and extras of the summer camp. This makes a very affordable Christmas gift for your child and gives them something to do during the Christmas Break. It is held every year the week after Christmas and is only $150.00. Space is limited so please reserve your spot early before it fills up. We often have clinics on request. If a group of your friends would like to bring your horses up on a weekend, we will be glad to offer you a clinic for the day. If you dont have a horse we will gladly loan you one of ours. We can come up with the clinic iterinary or you can tell us what you would like to learn for the day. 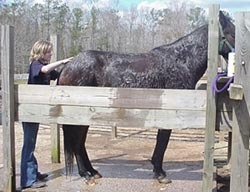 We love to fix problems that you are having with your horses or problems that you are having with your riding. We usually like to have a minimum of 6 people for the clinic and the cost is $50 per horse and rider. Lunch will be provided. Call and schedule yours today! **We will be glad to help you with your horses anyway that we can. If their is not something here that will help you, feel free to contact us and talk to us about your horse. If you just need some confidence on the trail rides, you can hire us to go with you for the day so we can tell you what you need to do to have a better partnership with you horse in different situations.